with your 2014-2015 state officer team. Tyler Graybill is an incoming senior at Hereford High School. He is currently the chapter president at Hereford and State President. He joined the FBLA program as a freshman in 2010. Tyler hopes to expand his knowledge in business and help grow the FBLA program. His future goals include running a successful FBLA chapter, continue high academic scores, college entrances into business schools, and enter the field of business administration. 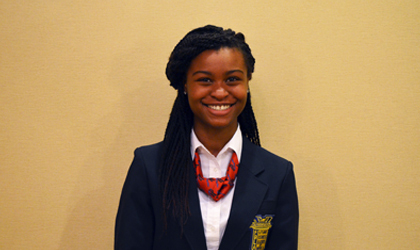 Chloe Diggs, a senior at North County High School in Anne Arundel County, MD, is proud to serve you as your 2014-2015 Maryland State Vice President. Chloe began her FBLA career during her sophomore year. She fused together her love for leadership and longing for business courses in order to set goals for herself. These goals led her to place first at the regional and state level, and to compete at the national level in Anaheim, CA where she decided a state officer position is what she desired. In addition to her participation in FBLA competitive events, Chloe has taken part in several science fairs ranging from the local to international level. Recently, she and a partner competed in Siemens We Can Change and placed first in the nation, receiving a combined scholarship of $50,000. While working alongside fellow scientists, Chloe has learned the value of teamwork. Chloe is excited to Step Up to the Challenge with Maryland FBLA. This includes brainstorming new ideas for the Special Projects Development Committee. She would like to end her 2014-2015 term knowing that she went above and beyond for Maryland FBLA. Carmen Lau, a junior at North County High School, is honored and excited to serve as your State Secretary-Treasurer for the 2014-2015 school year. Her involvement in FBLA started her freshman year. Since then, she has served as Chapter Vice-President and President. She is also an active member in her school and community by participating in a variety of clubs and volunteering in her free time. After being inspired and introduced to priceless opportunities, she is ready to Step Up to the Challenge and make this year one of the best in MDFBLA's history. If you have any questions, do not hesitate to shoot her an e-mail! Prateek Sayyaparaju, a senior at River Hill High School in Howard County, MD, is excited to serve as your 2014-2015 Maryland State FBLA Reporter-Historian. He is very involved with his local chapter serving as both the Vice President of the Professional Division and as a member of the Government Awareness Committee. He has also won numerous awards at the regional and state level. Prateek loves being on the new state officer team and cannot wait to Step Up to the Challenge and lead Maryland FBLA to another great year. Proudly serving as your last State Webmaster, Timothy Chen, a senior at River Hill High School, is ready to Step Up To the Challenge with Maryland FBLA. Since freshman year, Timothy has been actively involved in FBLA and is delighted to give back to its great community of leaders. Attending his very first state conference in 2012, he was mesmerized by Maryland FBLA. Working with the 2014-2015 state officer team, Timothy hopes to make your FBLA experience an exciting journey and to provide that same thrill he felt at his first SLC. Shannon Gray, a senior at Allegany High School in Allegany County, is extremely excited to be serving as your Region One Vice President. To Shannon FBLA is much more than another organization, it is a learning experience and a chance to network. She is proud to serve as the historian for her local chapter, as well as hold her spot on the State Officer team. Shannon is excited to make a difference in Maryland FBLA and help others step toward success. Liam Mercer is proud to serve Maryland FBLA as your Region 2 Vice President. 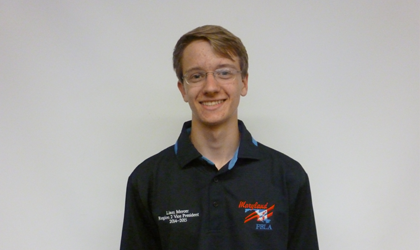 Liam, a senior at Catonsville High School, has been a member of FBLA since his sophomore year. Over this time, he has won multiple regional and state awards and has attended the National Leadership Conference twice. In 2013-2014, he was his Local Chapter President as well as a member of the State Project Development Committee. Liam is honored to help Region 2 and Maryland FBLA achieve new heights during the 2014-2015 school year. A senior at North Harford High School in Harford County, Ashley has only been in FBLA for one year. During that year, she has been an active leader in her local chapter, as well as attending all conferences throughout the year. She placed 7th regionally in Accounting I and competed at the state level. Not only will she be North Harford’s Chapter President next year, but she will be your 2014-2015 Region 3 Vice President. Ashley is enthusiastic to be working with the rest of the State Officer team to make the 2014-2015 year a fantastic year for Maryland FBLA! Samantha LeMay is a senior at Chesapeake High School in Anne Arundel County, Maryland and this year’s 2014-2015 Region 4 Vice President. She is also a three time local chapter officer. Sam found Future Business Leaders of America as a freshman and her passion was discovered. Outside of FBLA, she is involved in her school’s Student Government Association contributing to several committees. She is thrilled and cannot wait to help Maryland FBLA to Step up to the Challenge! Nick Santangelo is a junior at Marriotts Ridge High School in Howard County, Maryland and is serving as the 2014-2015 Region 5 Vice-President. Along with this role, he serves as his local chapter’s President and coordinator for the FBLA-sponsored blood drives at his school. He joined FBLA as a freshman and was inspired to get involved after attending his first State Leadership Conference. This inspiration was the impetus for him to run for chapter Vice-President. After a successful year as Vice-President, Nick had a desire to take his leadership to then next level and run for regional Vice-President. Outside of FBLA, he is his class Vice-President and enjoys playing soccer and running track. He is excited to Step Up to the Challenge with Maryland FBLA!